Kirtland - Ohio Wine Producers Association celebrated the Ohio wine industry at the 24th annual Vintage Ohio Wine Festival & a Little Brew, too, held Aug. 3 and 4. Thousands descended on the beautiful landscaping of Lake Metroparks Farmpark to enjoy the fruits of the vine along with a beer tent, entertainment on two stages, a cooking school, food offerings and a wide range of vendors. Donnie Winchell, executive director of the Ohio Wine Producers Association, said the attendance this year was one of the best, with Saturday being the larger crowd. She already is looking forward to next year when Vintage Ohio celebrates the 25th year. Seventeen wineries from throughout Ohio offered tastings of all kinds of wines. Five wineries introduced this year were: Urban Vintner (Willoughby), Andreas Dekar (East Cleveland), Kinkaid Ridge (Ripley), Camelot Cellars (Columbus) and Gunnisberg’s Dougherty Glen (Millersberg). Urban Vintner, located at 37484 North Industrial Parkway, Willoughby is a new winery established in 2016 in Lake County by partners Ed Trebets and Gregg Turk, both of whom grew up in Lake County. Urban Vintner has two brands, Urban Vintner with three wines and Muddy Paws with four wines and two coming soon, Benny Blush and Archie Blanc, both named after dogs. Trebets said that a portion of each sale of Muddy Paws wines is donated to the Geauga Humane Society Rescue Village. Prior to starting Urban Vintner, Trebets was winemaker for 13 harvests at Debonne Vineyards in Madison. He also made wines for Grand River Cellars and South River wineries. The goal of Urban Vintner is that customers can experience the production of wine from fruit to bottle. Andreas Dekar winery and cigar lounge is another new local winery, located 15905 Euclid Ave. in East Cleveland. Headed by Andre Hendrix, Andreas Dekar offers baskets, wine, wine tastings, parties and more. A beer tent featured craft beers from Maize Valley Winery and Craft Brewery (Hartville), Double Wing Brewing Company (Geneva), Valley Vineyards (Morrow), Debonne Vineyards (Madison) and Cellar Dweller Craft Beers. Vintage Ohio is much more than beer and wine. Lake Metroparks Farmpark held demonstrations of milking by hand and machine, cheese and ice cream making, a border collie demonstration, a light horse demonstration and vineyard tours. Lisa Delgado, of Geneva, directed the cooking school with help from chefs Fred Hutt, Mark Ivan Gomez and Frank Iacobucci. Each chef prepared a tasty, simple dish for sampling, such as her shrimp Mofongo and Iacobucci’s barbecue pork belly. She has appeared on the Food Network and Fox 8, was a chef for the RNC in Cleveland and has been honored as the top female chef in Cleveland. Iacobucci is a chef at Pronzo Italian restaurant in Willoughby. Entertainment was provided on two stages during both days of Vintage Ohio. More than 60 vendors participated in the two-day event, featuring crafts, soaps, cutlery, jewelry, clothing and more. Some vendors featured information on organizations and businesses. Winchell said the vendors offered interesting things to see and buy. Supported by a huge cadre of volunteers, Winchell said the 24th annual Vintage Ohio was a success. “Just wait until next year for the 25th,” she said. For information and dates of next year’s festival visit www.ohiowines.org. 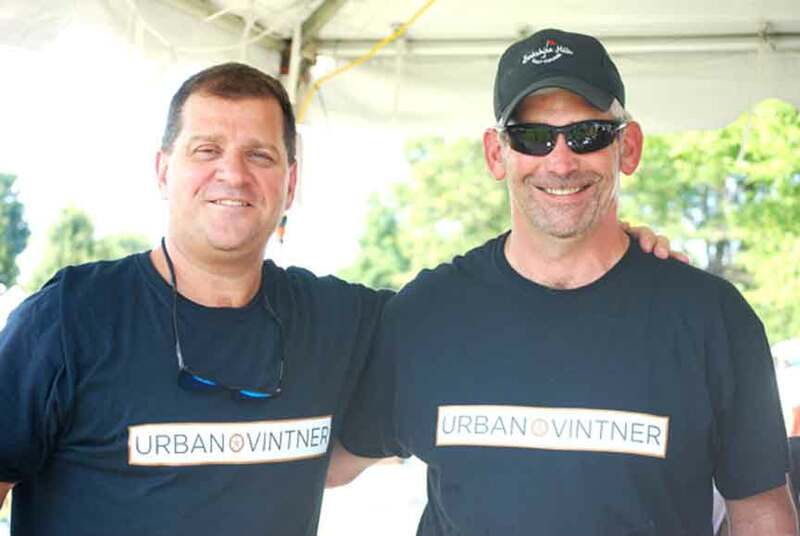 Gregg Turk and Ed Trebets are partners in Urban Vintners, located in Willoughby. The Lake County natives opened the winery in 2016. They participated in this year’s Vintage Ohio wine festival at Lake Metroparks Farmpark.